The big tent included packet pickup, a St Pete Running Company pop up store and several sponsor displays. 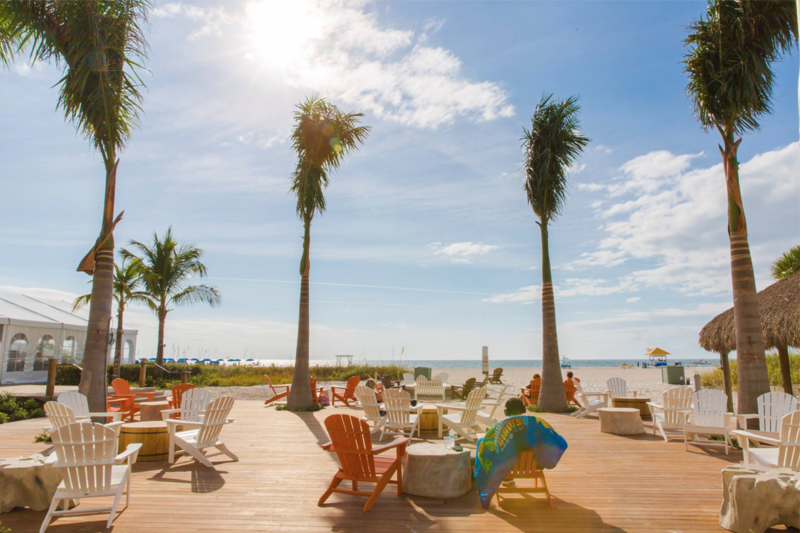 The St Pete Beach Classic offers runners a getaway weekend at the Sirata Beach Resort with plenty of racing options. The race is held over Martin Luther King, Jr. weekend each January. So, if you have a Monday holiday it makes sense to run all weekend long, right? 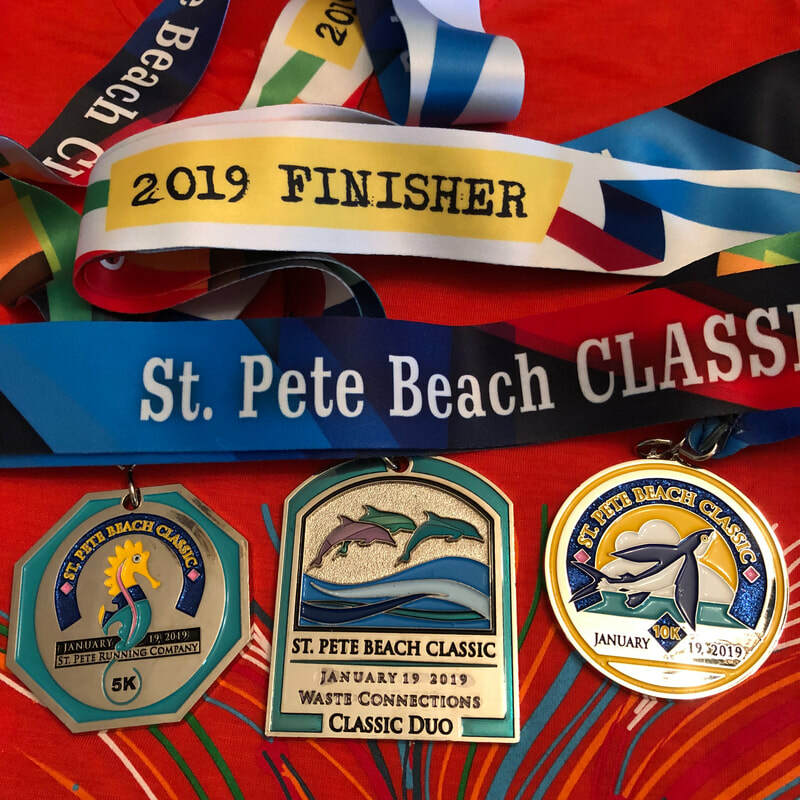 Even without Monday off, running at the St Pete Beach Classic makes sense to me. The first couple of years I ran the half marathon. It's one of my favorites. Last year, I tried the Duo Challenge. I liked it so much I did it again this year. There's a FREE Kids Run on Saturday between the 10K and 5K. So, there's fun for the little ones, too. 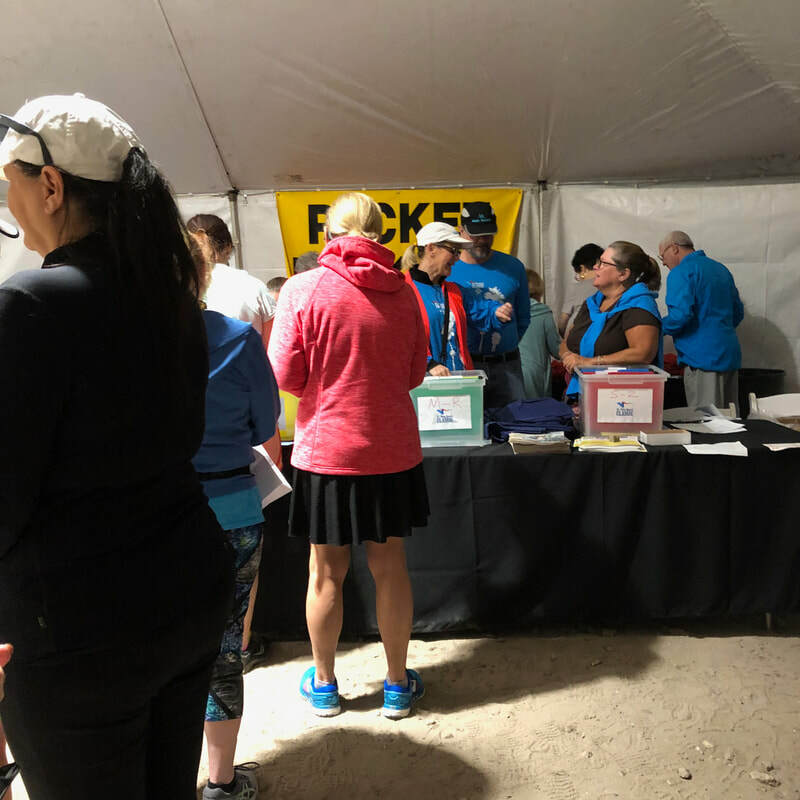 Packet pickup was available on site at the Sirata Beach Resort on Friday and Saturday. This year it was in a large tent rather than in the ballroom. Packet pickup on Friday was from 3 to 7 pm. On Saturday you could pick up 6 am to 11 am; and again from 4 to 5 pm. You could pick up for friends if you had a copy of their ID and confirmation. Every bib had a tear off raffle ticket for prizes after the race. All you had to do to enter was put it into the raffle box before you left the tent. The shirt this year was a bright color called Poppy. The energetic design explodes on the front of the ladies shirt. Ladies is a v neck, which I appreciate. It's a lightweight performance poly fabric that's perfect in Florida at this time of year. I saw a lot of runners racing in this shirt. It looked good at the end of the race. The SWAG included samples: Reef Safe suntan lotion, KT Tape, Shave Secret, and a Fat Tire lip balm. These were inside a cloth drawstring backpack with other local race information. I'll use everything. 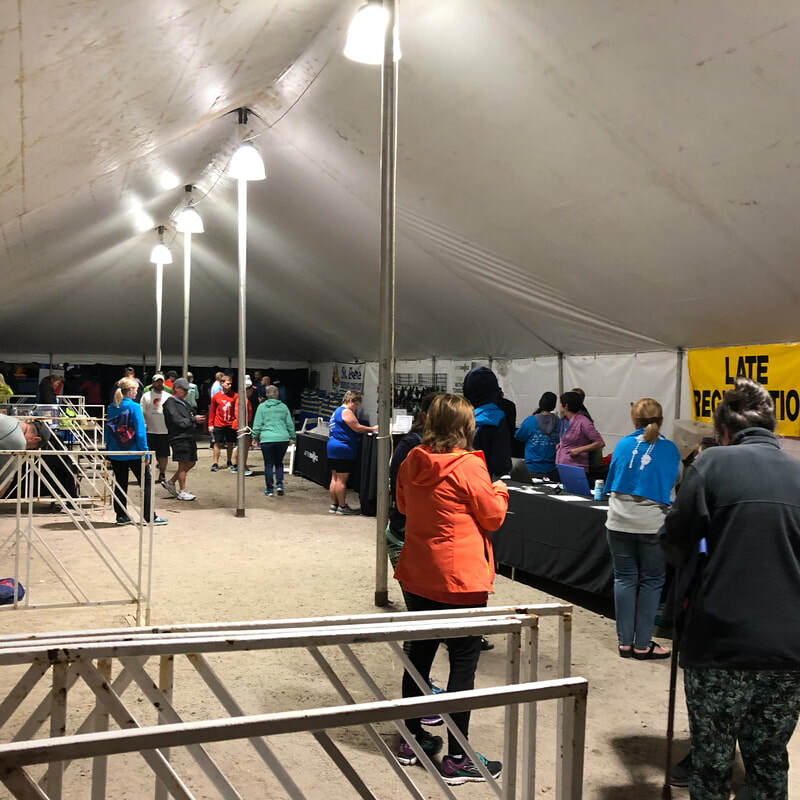 Runners received a super soft long sleeve tech shirt (ladies or mens cut), and a backpack/gear bag. Inside the bag were samples of KT Tape, Reef Safe sunscreen, Shave Secret and a Fat Tire lip balm. Nice samples and info on upcoming local races. Parking at the beach is only tricky if you don't follow directions. St Pete Beach Classic does a good job of teaming up with local businesses to provide free parking. Read your pre-race emails for details. ​There are public lots, too. If you plan on playing on the beach after the race it's best to park in the metered public lots. Or, spend the weekend at the Sirata and parking is a non-issue. Registration opens at the beginning of May. There are regular price increases as the race gets closer. 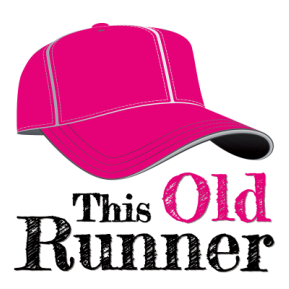 You can register online until the day before the races. You can also do late registration on race morning. 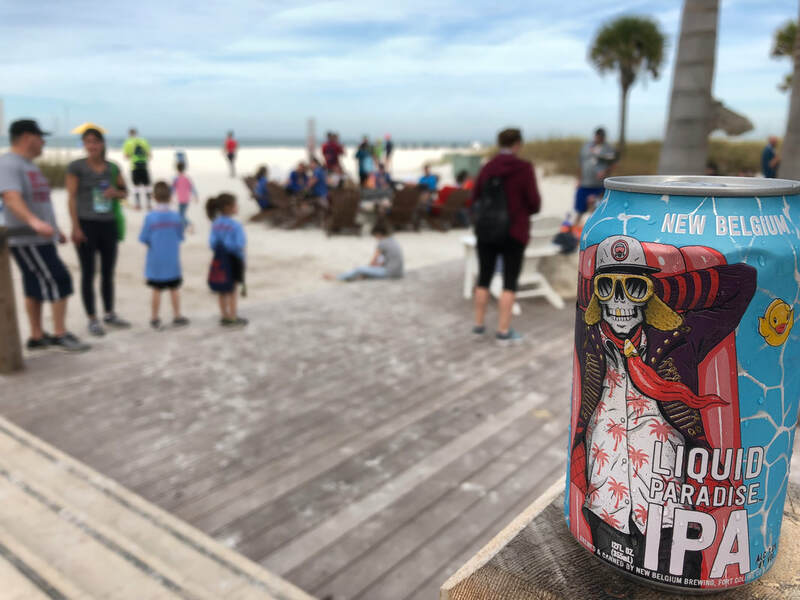 Opening prices for the 2019 St Pete Beach Classic events. There are increases as race weekend gets closer. The official photographer is BB Action Photography. They do an excellent job. Photos are up in 24-36 hours. Photos are an additional cost. All bibs had a timing chip. Timing mats for splits every 5K for the half marathon. No split mats for 10K or 5K. All overall winners determined by gun time. Age group winners decided by chip timing. ​Only the Marathon Challenge runners are timed in the 3.8 mile Beach Fun Run. 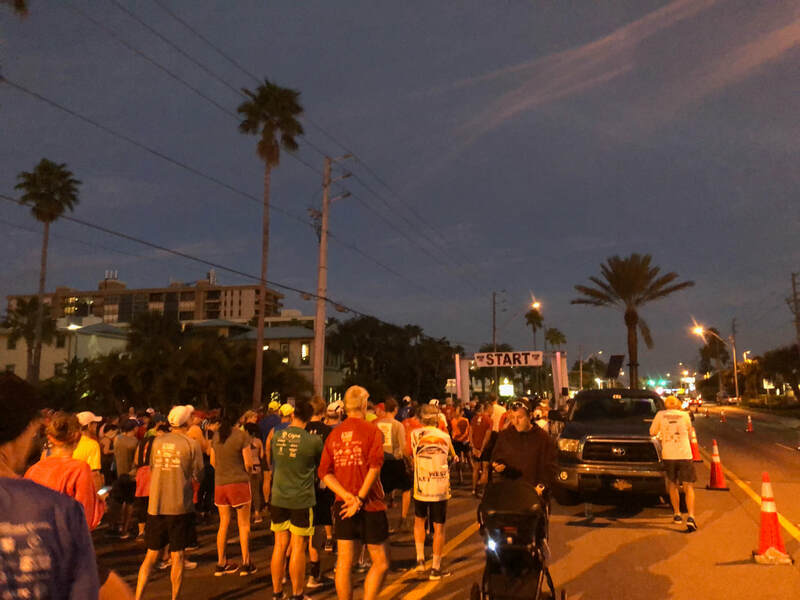 All the races begin and end at the Sirata Beach Resort on Gulf Boulevard. Since I ran the 10K and 5K, I headed north both times. Both of my races were big loops. 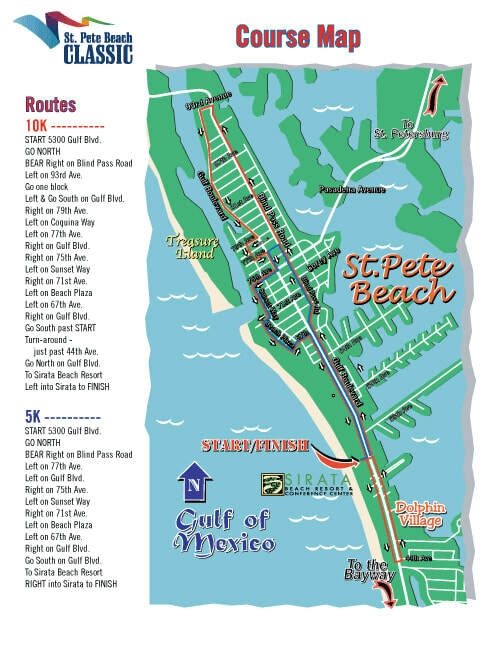 Part of each race was on Gulf Boulevard, then through neighborhoods with water views. It's a nice, flat course. I like getting a closer view of everything on Gulf Blvd. It's easy to notice things you can't see at all when you're in the car. The half marathon heads south first. I love the half course at this event. You run past the Don CeSar and along Pass-A-Grille Beach. 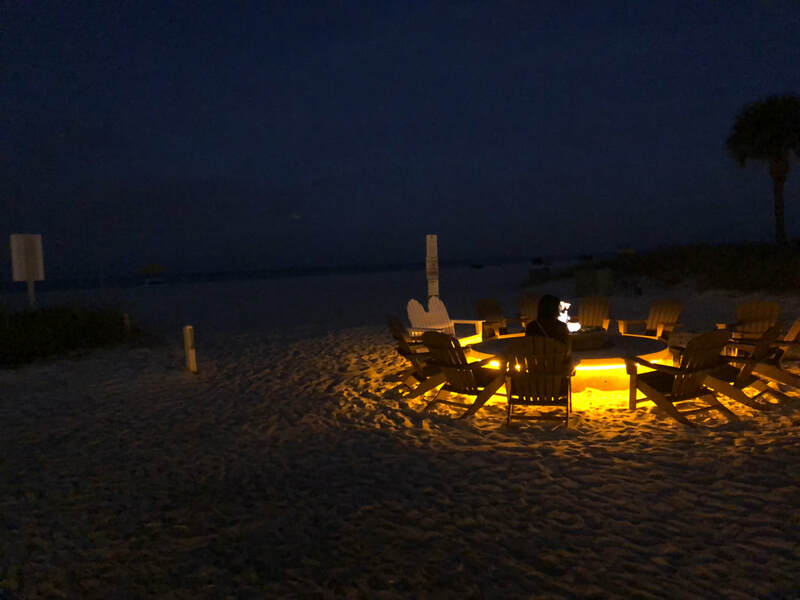 If you haven't been to Pass-A-Grille stop reading and go there now. 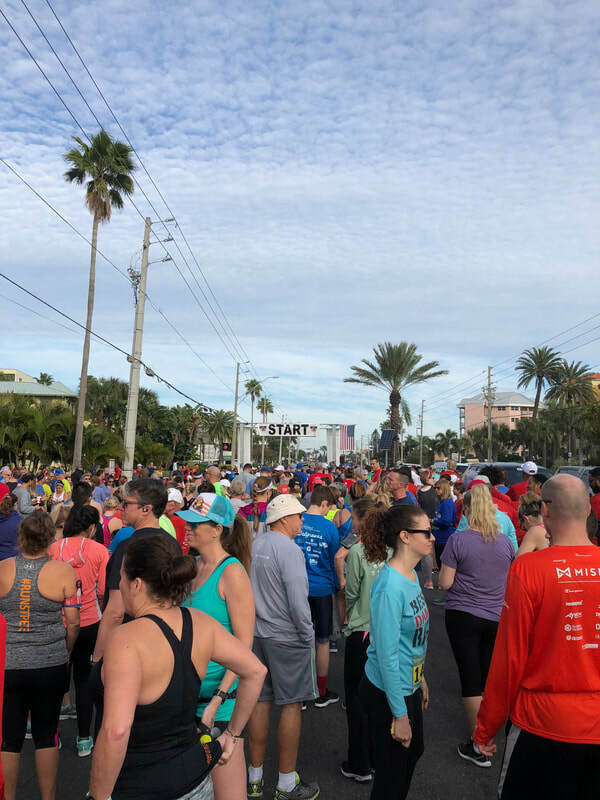 Running the half marathon is how I discovered little known streets and neighborhoods in St Pete Beach. There were water stops every 1.5 miles on course. The Pinellas County Sheriff's Department directed traffic and kept everyone safe. No pacers for the 10K or 5K, which is normal. There were pacers for Sunday's half marathon. Awards 3 deep in each age group. Duo and Marathon Challenge awards for first place only in each age group. Saturday: 62 degrees at the start. Breezy, but not windy. There was lots of cloud cover. Sunday was another story. 15-20 mph winds during the half marathon. 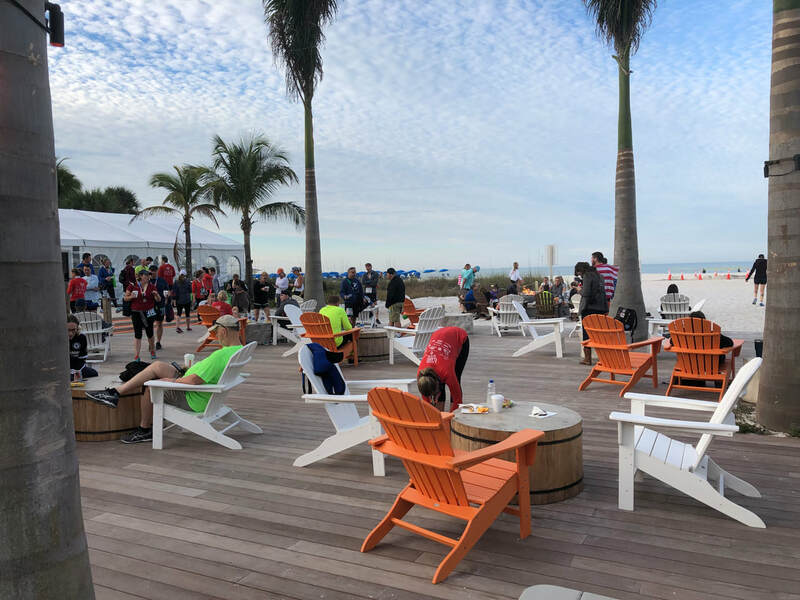 The area behind Harry's Beach bar — where you exit the food tent and post race festivities take place — has been remodeled into a fabulous space! I hadn't been to the Sirata since last year, so it was a big surprise. The addition of decking, lots more seating, and a fire pit are fantastic. Such a great place to relax before or after the races. The fire pit was beautiful at 6 am! Here are some photos at sunrise and later. 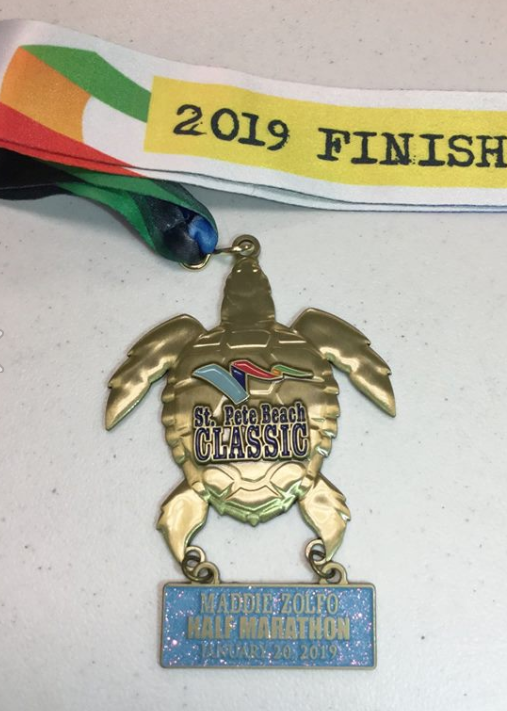 I ran a few races over the holidays, but didn't consider myself trained going into this event. I wasn't surprised or disappointed by my times. I was fueled and ready for the 10K. Not so much for the 5K. I didn't fuel properly between my races. (I had half a beer.) When I started the 5K my legs felt like cement for a mile. After that I was back in the groove. My mantra for the day was "run relaxed" and I feel like I did. The race is easy to run. It's flat. Everything is efficient and smooth from start to finish. The courses are marked and monitored. Water stops are good. Volunteers are kind. Interesting sights and sounds. There's a huge age span on participants, which I always like to see. It really is a local gem. We're super lucky to run here in paradise. #SeenOnARun #SceneOnARun — This edition of #SeenOnARun will be HEARD on a run. After the 10K, I grabbed a beer and talked to people. At the beer stand, I asked the guys if they thought drinking a beer between races was a good idea. One volunteer grinned and said, "Sure! That guy in the viking hat's already had 2 or 3." 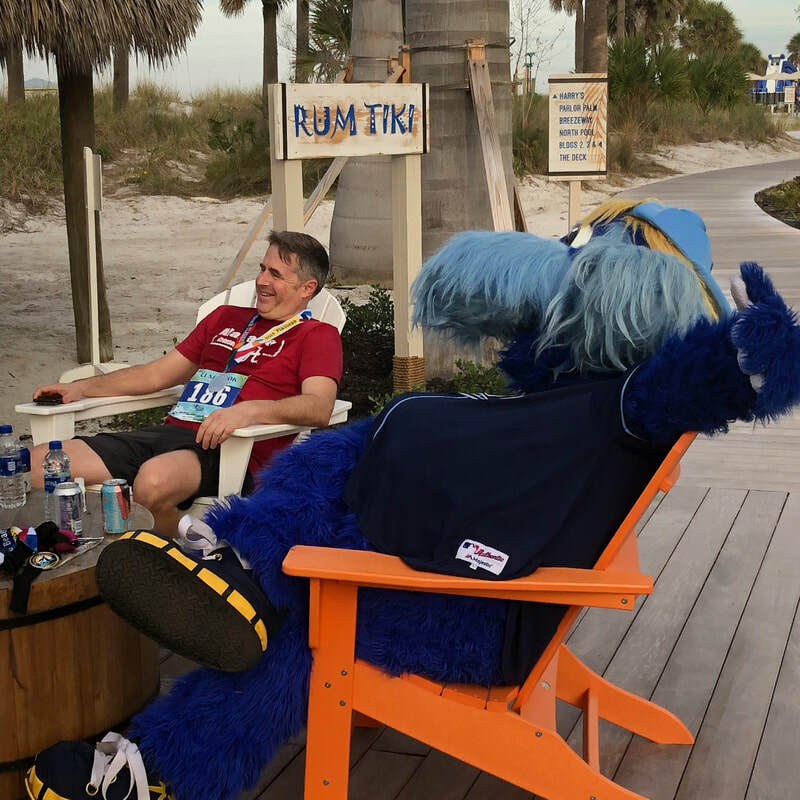 I guess it's a runcation, people. Don't forget the 'cation part! ​At the start of my second race, some runners behind me were laughing. One of them had asked for a "Flat Tire" instead of a Fat Tire in the food tent.